Editors' note: A photo and a video will be associated with this press release. Visa Canada is kicking off the new edition of Financial Soccer, a fast-paced FIFA World Cup™ inspired educational video game. The game tests players' knowledge of the Canadian financial system, responsible spending, budgeting and saving while they advance down the field and score goals against their opponents. Reinforcing Visa's global commitment to financial literacy, Financial Soccer combines the world's most popular sport with a high-quality financial literacy curriculum. The new Canadian edition of the game, released in both English and French, has updated questions, superior graphics and more exciting gameplay. A FIFA partner since 2007, Visa will roll out the new edition of Financial Soccer around the world in the lead up to the 2014 FIFA World Cup. Canada is the second country to unveil the new edition of the game, available at www.financialsoccer.ca, with China launching it earlier this year. 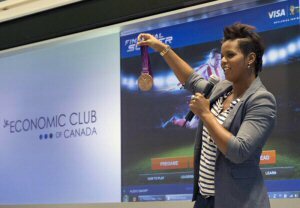 To celebrate the launch and the lead up to Financial Literacy Month in November, Visa is partnering with Canadian Women's Soccer icon and Olympic bronze medallist Karina LeBlanc to host a live Financial Soccer match as part of the Junior Economic Club's "Day on Bay" this morning in Toronto. Surrounded by local high school students, she will share her personal experience on the importance of money management, and cheer on the student teams through a lively game of Financial Soccer. "My biggest piece of advice for young adults is to learn the basics - create a budget and stick to it - and you'll be on your way to achieving your goals," said LeBlanc. "The resources offered by Visa will certainly help Canadian students understand the fundamentals of their financial future." 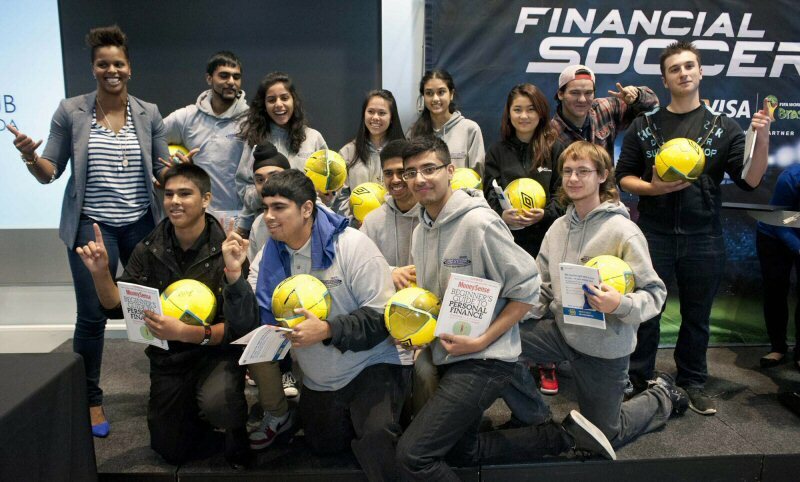 Financial Soccer is part of Visa's free financial education program, Practical Money Skills (www.practicalmoneyskills.ca) which offers free educational resources for educators, parents and students including personal finance articles, games, lesson plans and more. Visa has been promoting financial literacy in Canada since 1996 through Choices & Decisions, a program designed by teachers to provide practical, ready-to-use lesson plans for use in Canadian classrooms. 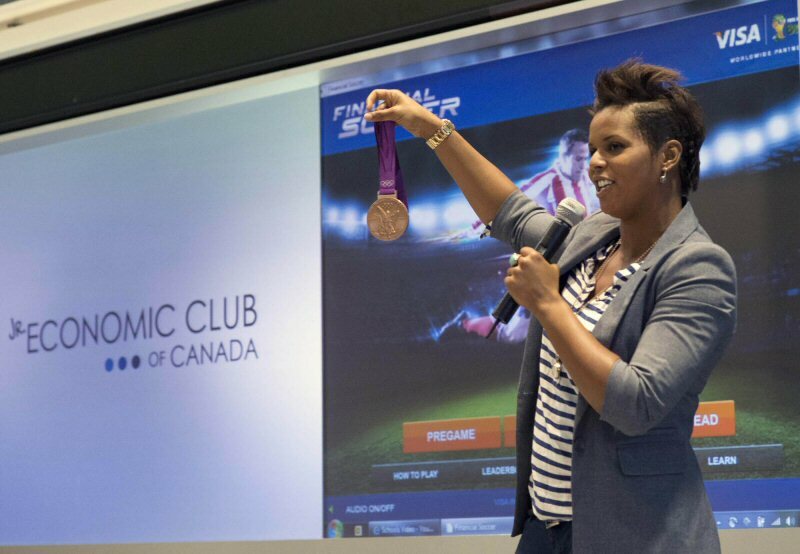 Canadian Olympic Medallist Karina LeBlanc shows an audience of GTA students her Olympic Medal at the unveiling of Visa Canada's Financial Soccer at the TMX Broadcast Centre on Tuesday October 15, 2013.